With a stay at RACV Noosa Resort, you'll be centrally located in Noosa Heads, a 4-minute drive from Noosa National Park and 6 minutes from Noosa Beach. This 5-star apartment is 1.7 mi (2.7 km) from Hastings Street and 11.9 mi (19.1 km) from Coolum Beach. 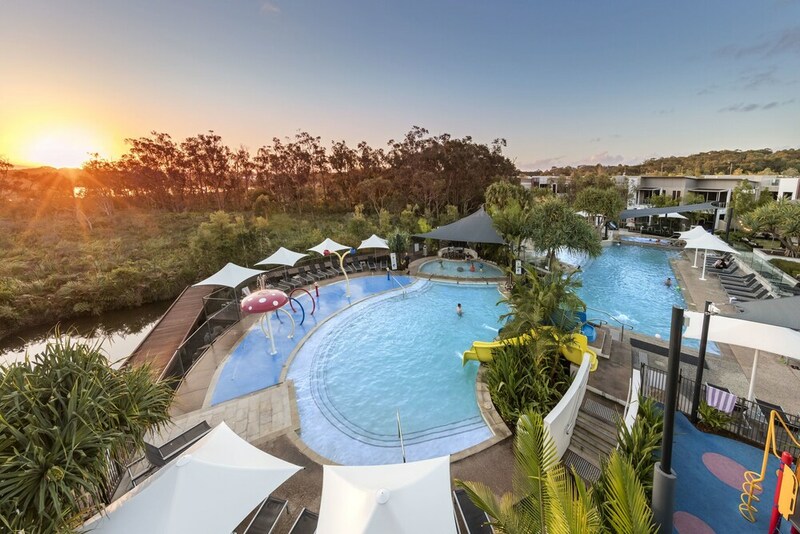 RACV Noosa Resort features a full-service spa, a complimentary water park, and 2 outdoor swimming pools. The apartment offers a restaurant and a coffee shop/café. A bar/lounge is on site where guests can unwind with a drink. A computer station is located on site and wireless Internet access is complimentary. Event facilities measuring 3240 square feet (301 square meters) include a conference center. This luxury apartment also offers a children's pool, a fitness center, and a rooftop terrace. An area shuttle within 2 km and a beach shuttle are complimentary for guests. Onsite self parking is complimentary. RACV Noosa Resort has designated areas for smoking. Acuri - Overlooking the pool, this restaurant serves breakfast and dinner. Guests can enjoy alfresco dining (weather permitting). A children's menu is available. Open daily. Dazza's Bar - Overlooking the pool, this bar serves lunch, dinner, and light fare. Guests can enjoy alfresco dining (weather permitting). A children's menu is available. Open daily. An outdoor tennis court and a complimentary water park with waterslides are featured at the apartment. 2 outdoor swimming pools are on site along with a children's pool. Other recreational amenities include a fitness center. One Spa has 6 treatment rooms including rooms for couples. Services include facials, body wraps, body scrubs, and body treatments. A variety of treatment therapies are provided, including aromatherapy and hydrotherapy. This property offers transfers from the airport (surcharges may apply). Guests must contact the property with arrival details 48 hours prior to arrival, using the contact information on the booking confirmation. Reservations are required for massage services and spa treatments. Reservations can be made by contacting the apartment prior to arrival, using the contact information on the booking confirmation. The property has connecting/adjoining rooms, which are subject to availability and can be requested by contacting the property using the number on the booking confirmation. Parking height restrictions apply.